PV-520A Impedance analyzer—Detect all ultrasonic related parameters, application for underwater acoustic area and High Power ultrasonic area such as piezoceramic, piezoelectric crystal, ultrasonic transducer, converter, ultrasonic welding, ultrasonic sensor and so on. Users can judge the elements from the impedance diagram directly. 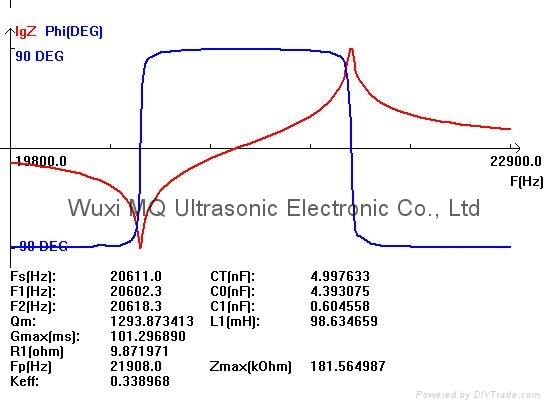 Fs: mechanical resonance frequency: The working frequency of ultrasonic system, it should reach the expectation value as much as possible in the design; also, it should be matched with the ultrasonic power. C0: The capacitance of static branch in the equivalent circuit of piezoelectric elements. Balancing the C0 properly can increase the factor of ultrasonic power. Qm: Mechanical quality factor. When Qm is higher, the efficiency of system is higher. Yet, if Qm value is too high to be matched with the ultrasonic power, the system cannot run efficiently. Qm needs to be set within the proper range. Generally, Qm of ultrasonic cleaning transducer is between 500 and 1000. For ultrasonic welding system, Qm is between1500 and 2500. R1: the dynamic resistance, it should be as lower as possible in the same condition. 4）Fp：FP is the max impedance for piezoceramic transducer. 6 CT：CT reflect the activity capacity for the pizoceramic under 1KHZ. 7）R1： R1＝1／Gmax， Gmax is the max admittance. This factor only used in piezoceramic .